Well. 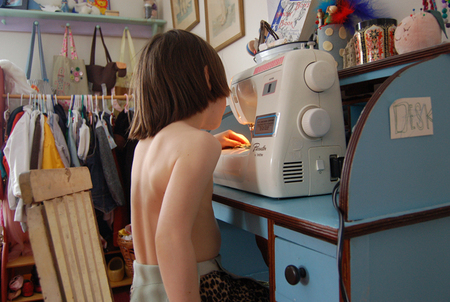 My favorite little tailor has officially set up shop in the house, and staked a claim on my old sewing machine ("Mama, when we're talking about this machine, should we call it 'your machine' or can we call it 'my sewing machine'?"). The sewing has taken over a corner of his bedroom - right next to the costume rack, naturally. I've much to say about what he's been up to, but I'll wait and let the little man himself tell you all about it soon, I do hope. I'm a little curious as to what the results to his 'handmade' wardrobe might be after watching a few too many Jimmy Hendrix You Tube videos with Papa ("for the costumes!" of course). Those buttoned-at-the-bottom pants are rad, I must say. My favorite quote from last week? "Mama, I'm SO glad someone invented such a thing as a seam ripper!" Me too, buddy, me too!